Who needs a pep talk (or at least a good reason to bash some subpar Yankees fans)? If you’re looking for something blaming blown fan interference calls from years ago or foul poles for Orioles playoff losses to the Yankees, you might want to close your browser now. You won’t find that here. I also don’t want you to forget what my mom told me in 1983. I was 8 years old and had a ticket to Game 6 of the World Series between the Orioles and the Phillies at Memorial Stadium in Baltimore. The Orioles won it in five, in Philly. I sobbed, happy they’d won but disappointed I wouldn’t get to see a game. As part of her effort to cheer me up, my mom explained that there would be other Orioles World Series games to go to. Next October will mark the 30th anniversary of what was a great pep talk at the time from a truly fantastic mother; I would have told my kid the same thing, especially given the club’s history of success at that point. But, the total number of Orioles World Series games that have been played since that day stands at zero. If none of this is making things better, you can at least take comfort in the fact that Yankees fans are people too and Friday night’s game meant a lot to them, so much in fact that 40,000 or so of them weren’t in the stadium for the start of the game. Maybe they were waiting until the last minute to see if they could sell their tickets to someone else—well, 20% of them at least. Some Yankee fans will blame traffic for their home field being a ghost town for the first few innings Friday evening. If only that city had a mass transit system large and efficient enough to motivate people to leave their cars at home! Oh, the traffic! The horrible traffic—in a city with enough Yankee fans that don’t even own cars to get stuck in traffic with, that they could fill The House That Jeter Built (and then likely complained to an umpire about) multiple times over. 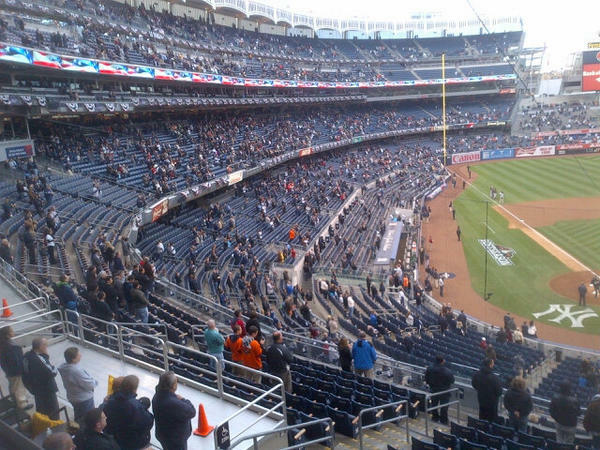 Another excuse is that the real Yankee fans have been priced out of the new stadium. That’s a valid concern, but were they priced out of all those tickets to Game 5 that other “fans” were dumping for around $20 on StubHub? Some New Yorkers will also say it’s too hard to leave work a few hours early on a Friday. It’s funny how a weekend in The Hamptons is reason enough for that, yet the final game of a first round playoff series no longer is. I say “no longer” because it’s beginning to look like some Yankees fans have become so spoiled by their team’s success that the deciding game in a first round playoff series just isn’t enough for them anymore. It’s a shame how doing well year-after-year-after-year, and watching teams filled with almost any megastar management feels like signing, will beat you down like that. Maybe being one of the final four fan bases out of 30 with a team still in the race will inspire more Yankees fans to make the ALCS games important, unlike that good-for-nothing ADLS Game 5 that Major League Baseball had the gall to schedule at 5 p.m. The one set of Yankee fans I don’t blame for not making Game 5 attendance a priority are the people who’ve jumped on the team’s bandwagon in cities across America that are too far away for them to realistically make it to Yankee Stadium. Like that guy on the west coast who has no ties to New York whatsoever yet wears that Yankees cap because the colors are cool and roots for them as soon as he hears from a friend that they’ve made the World Series again. I don’t blame that guy or the thousands like him at all. Those guys out there are doing great work and were never following most of the games (or the fact that baseball season has started) anyway. 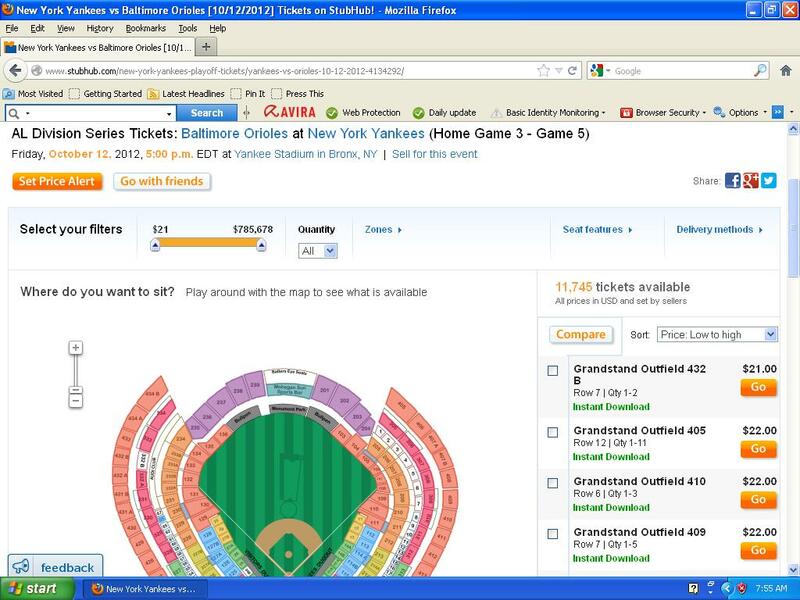 About 30 minutes after the Baltimore Orioles defeated the New York Yankees in Game 4 of the ALDS to force a decisive Game 5 Friday in the Bronx, I checked StubHub to see what seats are available for it. 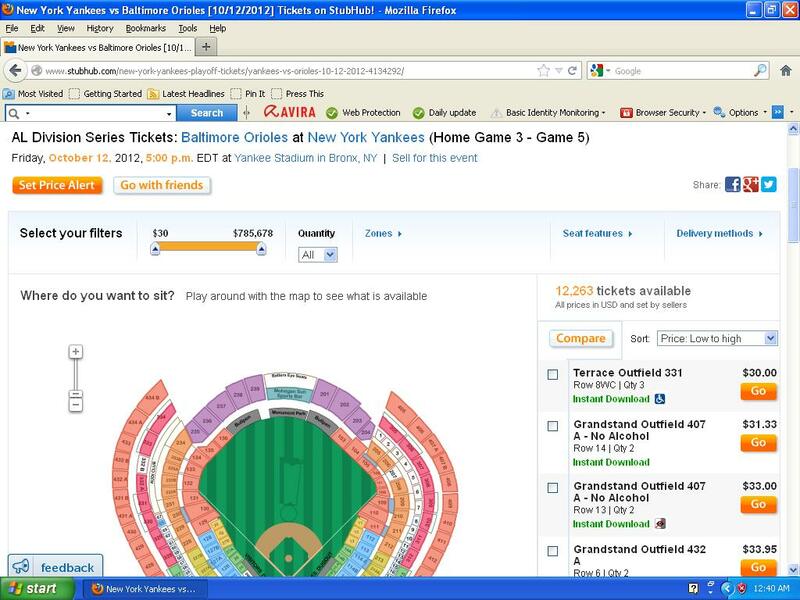 I can’t get over what I found: There are more than 12,000 Game 5 tickets for sale on StubHub and you can get in for as little as $30. Is this a joke? 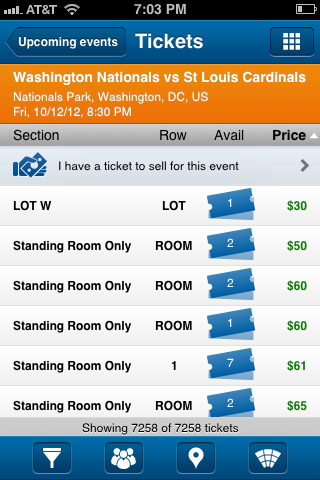 Over 20% of Yankee Stadium’s seats for the final game of the ALDS are for sale on StubHub and they start at $30? Update: It’s just about 8 am on the day of Game 5 and, as the screen capture below shows, with about nine hours to go until first pitch, there are 11,745 tickets left on StubHub and prices start at $21. Around the time the Washington Nationals’ Jayson Werth was rounding the bases after depositing a Game 4, 9th inning, walk-off home run into the St. Louis Cardinals bullpen, I checked StubHub for tickets to Game 5, which will decide who moves on to face the San Francisco Giants in the National League Championship Series. That StubHub search showed there were 7,258 tickets available through the “fan-to-fan ticket marketplace” with Standing Room Only tickets starting at $50, as shown in the first screen capture below. Just over 40 minutes later, there were nearly 2,000 fewer tickets available on StubHub and, as the screen capture below shows, the lowest priced Standing Room Only ticket was going for $83. 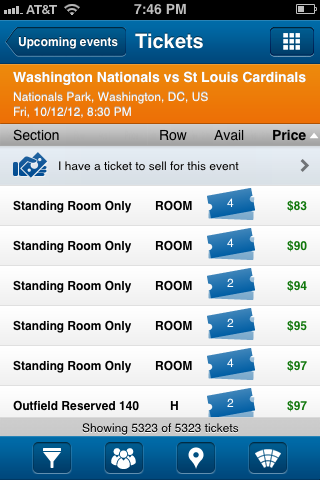 With one swing of the bat, Werth has stimulated the DC economy, on StubHub and beyond. Before Major League Baseball expanded its playoff format this year and added a second wild card team in each league, the sole wild card winners in both the American and National Leagues would open the playoffs against the team with the best record in their league. Under the old system, if two teams finished tied for their league’s wild card spot, they would face each other in a one game playoff. In the American League this year, the Baltimore Orioles and Texas Rangers both finished the regular season with 93-69 records, capturing the two American League wild card spots. If this had occurred a year ago under the old one-wild-card system, the two teams would have done exactly what they did last night under the new system: played a single game with the winner advancing to face the New York Yankees in the ALDS. Hate the one-game Wild Card playoff concept, but love the Orioles advancing. Great town. Fun team. The fun deserves to be spread around. In the future, I hope to see MLB expand the wild card game to a three game series; one game just doesn’t seem like enough. But, in the meantime, let’s not pretend the Orioles are moving on because of some flawed new system. Tweets like the one above from Peter King of Sports Illustrated—or the one below it that he retweeted—bother me a little bit. King and Hartles don’t flat out say the Orioles haven’t done enough to be where they are, but they don’t exactly make it sound like the Orioles truly deserve to be advancing after defeating Texas just once. When discussing the 94-68 Atlanta Braves, who lost the NL Wild Card game to the 88-74 St. Louis Cardinals last night, there’s reason to complain the new system is unbalanced and that a more deserving team has been left behind. But if the Orioles/Rangers wild card tie had occurred a year ago under the old system, these two 93-69 teams would be right where they ended up this year. This Orioles-Yankees ALDS match-up isn’t happening because of a new playoff system that has somehow ‘shared the fun’ with Baltimore. And this certainly isn’t about the O’s getting lucky through the new format, as the tweet below states. Baltimore advancing to the ALDS is about them playing a great regular season and posting the same record as back-to-back AL playoff champion Texas, before going on to defeat the Rangers by four runs in a single game that would have been played under the old system too. The Orioles have 100% earned their place in the ALDS and the team, not the new playoff format, deserves the credit.